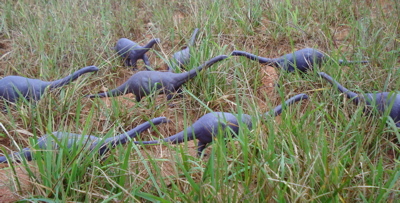 The Cetiosaurus was a fine Dinosaur toys choice by Invicta. It does have a sense of motion about it that I really like. 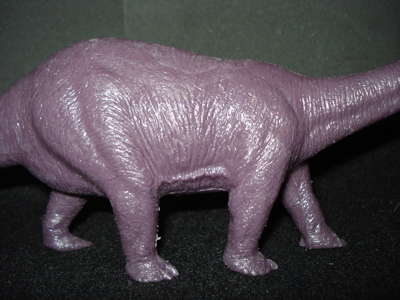 On the other hand it lacks the crisp detail of the earlier figures such as the Invicta Diplodocus. foot clearly defined. 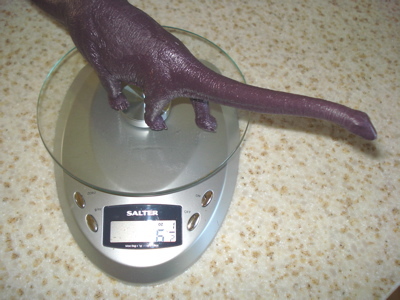 A clear improvement over the earlier Diplodocus. 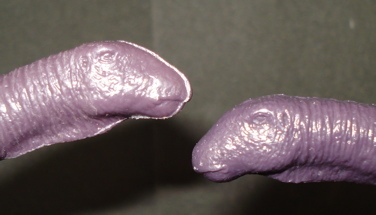 (If only the Cetiosaurus had been done in the same flat plastic. What possessed them to use this shiny purple?) The belly provides its bonafides. 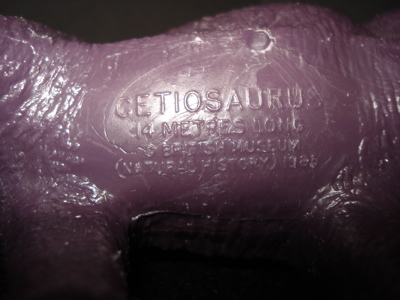 Current knowledge makes the Cetiosaurus closer to 17 meters than the "14 metres" noted (imprinted, embossed) on the figure. 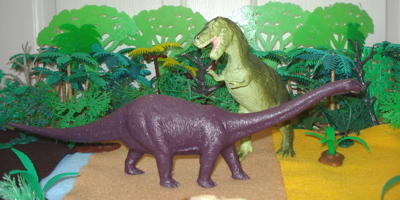 It was only three years later, though, that the Invicta Cetiosaurus, and the rest of its line, found themselves mortally surprised (below) by the appearance of the Carnegie Collection, here in the form of an early (1988) Carnegie Tyrannosaurus Rex. 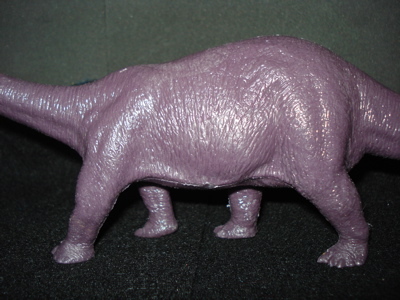 New figures continued to appear until 1993 when the last of the figures, a Dimetrodon, was introduced. 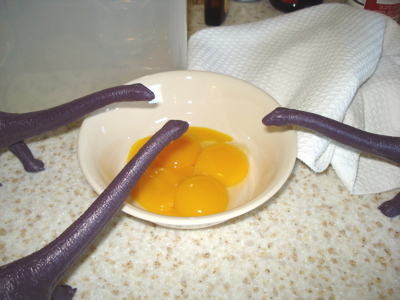 They remained in production until, perhaps, 2003. I just don't know. 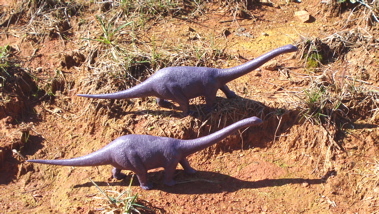 I do know that it is the fourth of five Sauropods (of a total of 23 figures) that Invicta produced. 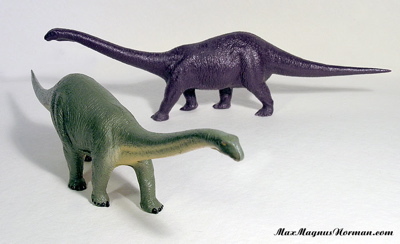 These were the Diplodocus (1974), Mamenchisaurus (1980), Brachiosaurus (1984) and later the Apatosaurus (1987). Quite a high Sauropod percentage for one line. 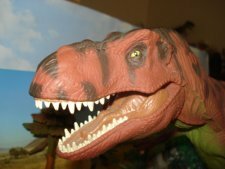 These may be found in the left over stock of out-of-the-way museums but more often from private sellers on eBay or in garage, yard or estate sales and at flea markets. Prices will probably range upwards from $15.00 with the factory painted models (being more equal) going for more. I haven't seen many Invicta Dinosaur toys that have been chewed on as the plastic is not tasty and the texture is not inviting.